Patient M is a female software engineer in her early 40s. She first came to see me for her hair loss on April 30th, 2015. Her symptoms began in the end of 2014 during a stressful assignment. 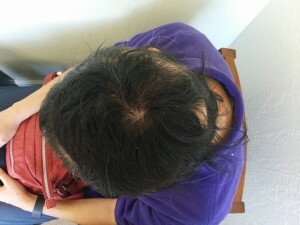 She experienced severe fatigue, poor sleeping quality, lost of her voice and shedding hairs. Being a health conscious person, she immediately sought medical attention at a nearby research university. She was diagnosed as alopecia areata by the physician at the university and was told it is an autoimmune disease. She was given cortisone steroid shampoos and cortisone steroid shots. She didn’t see any improvement with these treatments and continued to see her health decline. So she found me on the internet after searching for some alternative solutions. On her fourth visit, she told me that she began to feel different but she had a lot of fears. Every time she applied the cortisone shampoo, she lost more hairs. It triggered fear in her. The physician at the university suggested her to undergo immune suppressing therapy. She had lost confidence in modern medicine and didn’t want to receive immune suppressing therapy. She decided to use only acupuncture and herbs to restore her health. June 5th, 2015. Patient is only being treated with acupuncture and herbs. She began to see improvement. 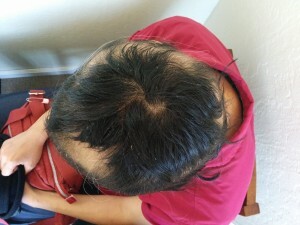 After a week of only herbs and acupuncture, patient improved significantly. She started to see hair growth. Furthermore, her overall health had improved. Her fatigue and her hoarseness was noticeably less. Her hairloss has stopped but because she had very little hair left, it is not clear if the reduction in hairloss was due to improving health or having too little hair. June 19th, 2015. Patient’s improvement continues. 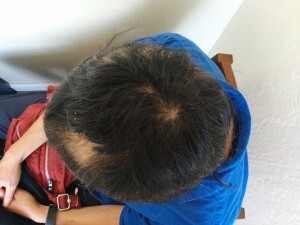 About two months into treatment, not only had the hairloss stopped, we can see significant regrowth. The thin hairs began to thicken and the area of thick hairs gradually expanded. July 24, 2015. About three months into treatment. On the pictures, some area appear to be “bald”. However, upon closer inspection, you can see that the follicles are intact. 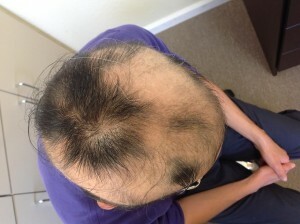 They visually appear bald because of the contrast with the area of thick growth. 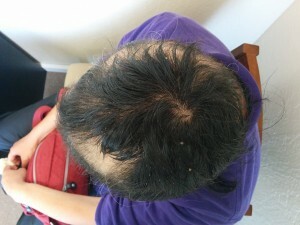 The “bald spots” continued to shrink slowly as the hair growth improved. 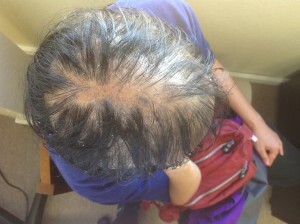 By the time I am writing this blog, the patient’s hair is 90% recovered. 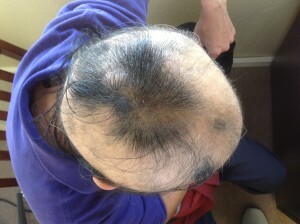 The residual “bald spots” are expected to disappear. We are expecting a full recovery soon. 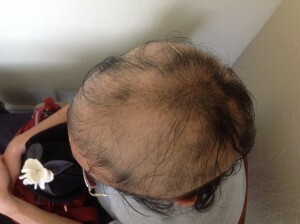 The total course of treatment is about 7 months. The patient saw me every week for acupuncture and herbs. Each visit cost roughly $150. 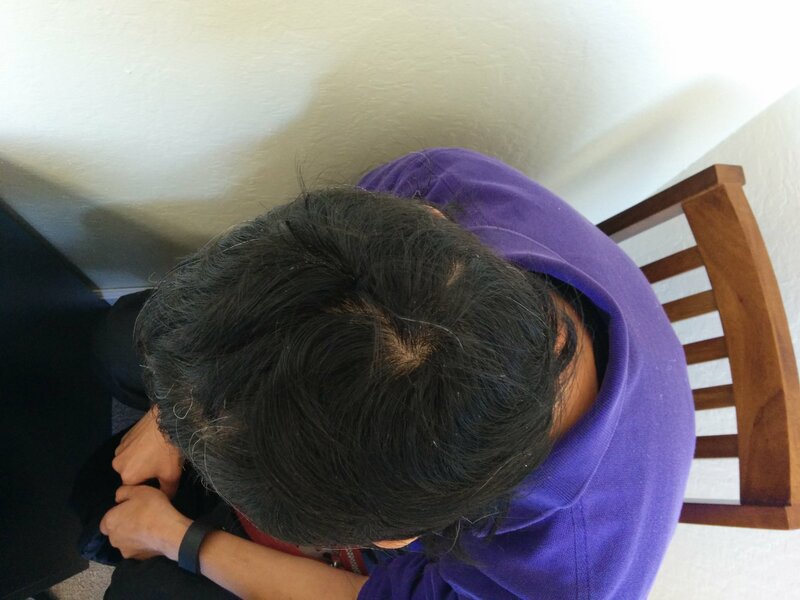 The total cost of treatment is estimated to be $4000. August 28, 2015. Four months into treatment. August 28th, 2015. Upon closer inspection, you can see hair follicles are still alive in the “bald spots”. 1. The patient is a very good patient. She is an engineer so she is logical and educated to follow through with the course of treatments. Her income also allow her not to be stressed with the cost of treatment. 2. The patient has very good health habits. She has a backyard garden where she grows her own vegetables. She does not have any bad habits such as alcohol or tobacco use. September 11, 2015. 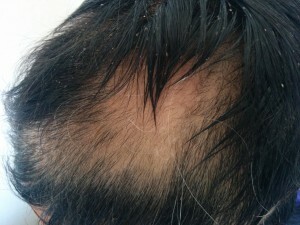 “Bald spots” continue to shrink as hair growth thickens. 3. She sought help from us very early. She was about four months into her problem, while most other hairloss patients have suffered for years before seeking help. 4. Because she sought help so early, most of her hair follicles are still alive. When patient sought help after years of hairloss, many follicles have died. The hairloss can be stopped but regrowth may be impossible due to lack of follicles. September 18th, 2015. “Bald spots” are becoming smaller. October 9th, 2015. Almost a full head of hair. 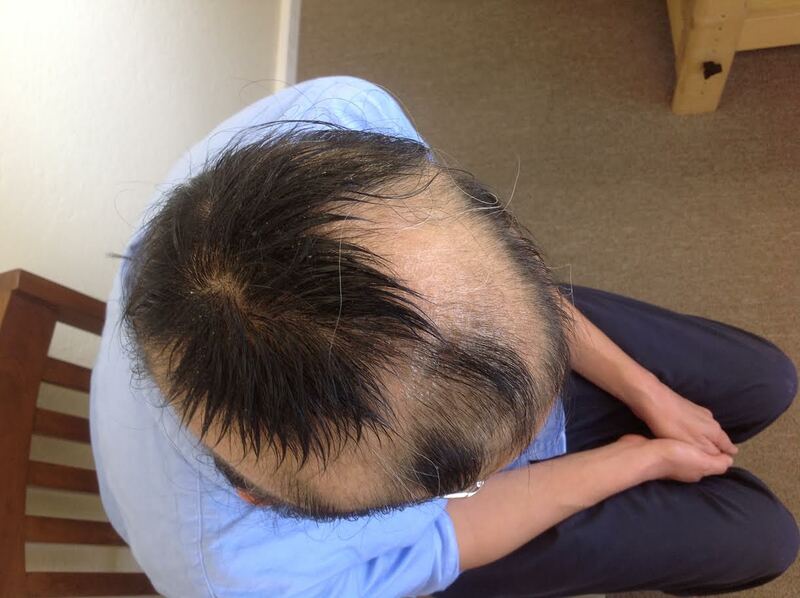 “Bald spots” are minimal. Patient is expected to have a full recovery.